Some guys in Amami’s class wonder out loud why she isn’t bullied by the other girls. She’s very strange sticks out like a sore thumb; not exactly qualities that make you popular in high school. But this week answers that question, beyond the obvious fact that if girls bully Amami, they’ll have to answer to her ghostly friends. It’s not fear or deference that make Amami surprisingly popular in her class; but rather gratitude for making their humdrum high school lives much more interesting. Inoue constantly denies the existence of ghosts despite overwhelming evidence to the contrary (including the circling spirit of her own beloved Grandma), but she sounds more like she’s trying to convince herself. It’s also counterproductive to resent Amami when she’s so kind, going so far to interpret and meet the needs of the ghosts around her with such dedication she neglects her own life and health. 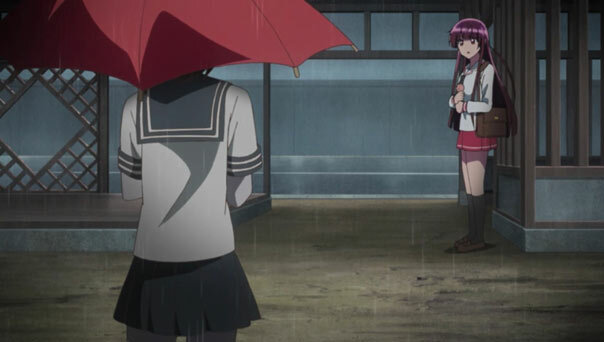 As such, Amami needs friends and Inoue in particular to dry her off from the rain, take her to the nurse’s office to catch up on some rest, and generally look after her. We see that the fruits of Amami’s kindness are a double-edge sword (she attracts Pervy Ghouls along with Roll Call Samurai or Faceless Umbrella) but it’s typically a net positive: she helps those in need even though they’ve passed on, because no one else can. Because she can see and hear them, she can’t ignore them; it’s just not her. I suppose I should also mention that this was another fun and hilarious episode. 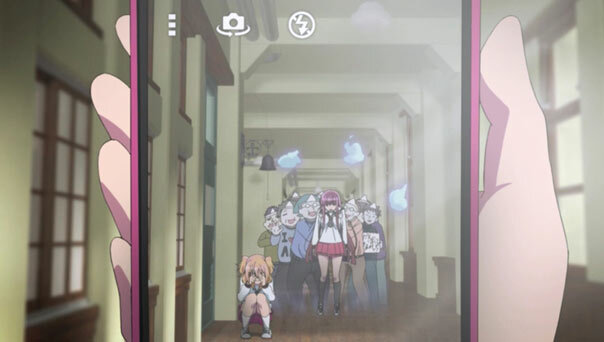 Many laughs are to be had, mostly in reaction to Amami or her ghostly friends’ gestures, actions…even texts! Also good for some chuckles: the recurring joke of the only guy in the circle having stuff thrown at his face. The evident 4-koma roots give the show a “grab-bag” structure and the eyes-through-the-hair designs of the “cool girls” is odd, but those are minor niggles. 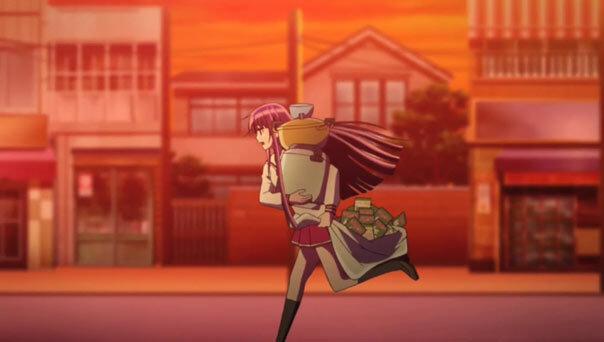 The well-timed and varied comedy of Re-Kan is enriched by the profound decency of Amami’s character, and the sincere desire of her classmates to root for and support her.